This is seedpot by Rosemary Lonewolf is from 1978. 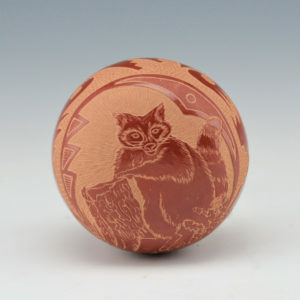 It is fully polished and has a raccoon on the top of the piece. Surrounding the sides are lightning, cloud and water patterns. Note how on the sides she etched into the tan area with little circles, which creates a striking appearance. The piece is signed on the bottom “Apple Blossom”, which is her name in Tewa. It is in excellent condition with no chips, cracks, restoration or repair. Jody Folwell is known for her creative pottery shapes and designs. This bowl is one of her unique shapes with with an asymmetrical rim, a round body and one flat side! The flat side has the etched design. Jody says the figure is a cross between a water serpent and a lizard. There are additional corn and star patterns on the side. The jar is fired brown with various colorations from the firing. It is signed on the bottom, “Jody”. It is in excellent condition with no chips, cracks, restoration or repair. Susan “Snowflake” Romero’s pottery is highly polished and intricately etched with detailed imagery. Many of her skills are ones that she learned from her father, Joseph Lonewolf. This seedpot has a realistic buffalo etched onto the top of the piece. On the sides are buffalo tracks and two petroglyph style buffalo. Note also how Susan has etched her pottery. 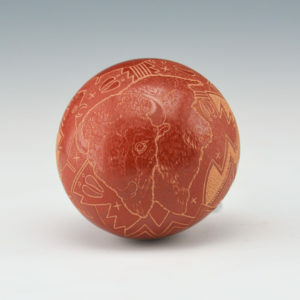 The polished red is the surface, and then she often etches just the polished area away to reveal the matte red and the going deeper, there is the tan of the clay. It is very complicated and time consuming to etch in this manner! However, the results are exceptional. The piece is signed on the bottom in the clay with her Tewa name, “Pho-sa-We”. It is in perfect condition with no chips, cracks, restoration or repair and signed on the bottom. Elijah Naranjo learned to make pottery from his mother Dolly Naranjo and sister Jody Naranjo. 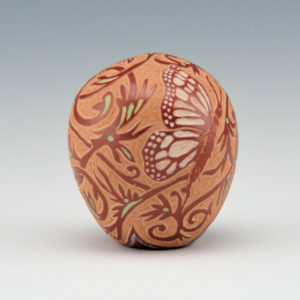 He works in a similar style with the sgraffito designs and brown firing. 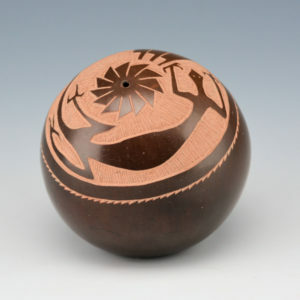 This small seedpot has a Mimbres style lizard on the top. 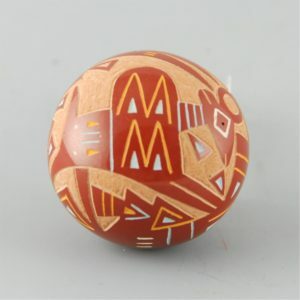 It is fully polished and there are additional feather designs in the clay. The seedpot is from 2000. It is in excellent condition with no chips, cracks, restoration or repair. 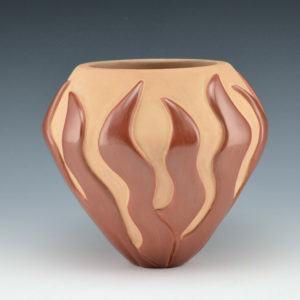 Christopher Youngblood creates dynamic pottery designs within the context of his traditional techniques. This creative bowl uses the technique of carving the melon ribs give a more free flowing appearance. Here the bowl has flames which are carved into the clay and climb up the side of the bowl. Note in areas how they overlap and raise further off the surface! The bowl is delicately carved and highly polished. The matte background area adds to the depth of appearance of the brownish-red color of the flames. The bowl has been traditionally fired. It is exciting to see such innovative designs and precision carving balanced with innovative concepts. Christopher has won numerous awards for his pottery including “Best of Pottery” win at Santa Fe Indian Market in 2014. This is an amazing miniature bowl by Rosemary Lonewolf! 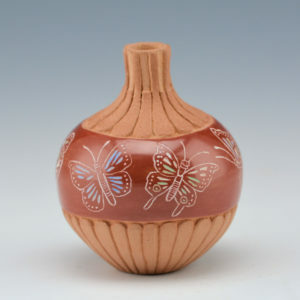 It is a seedpot with two butterflies encircling the piece. Separating the two butterflies are polished vines which encompass the remainder of the surface. It is highlighted with additional clay slips. The various colors are all derived from natural clay slips. The seedpot is in excellent condition with no chips, cracks, restoration or repair. Tina Garcia was well known for her use of traditional shapes in her pottery. This is a classic long neck water jar. There is a double shoulder and then a sharp rainbow ridge around the entire piece. The elongated neck curves in and then out to the rim. The double shoulder is always technically more difficult to make. 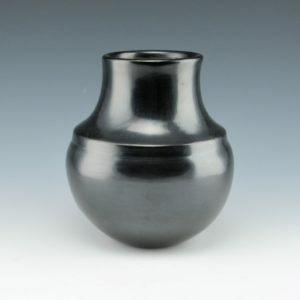 The jar has a wonderful polish and a deep black coloration from the firing. It is signed on the bottom in the clay, “Tina Garcia” It is in excellent condition with no chips, cracks, restoration or repair. Teresita Naranjo was a daughter of Christina Naranjo and know for her deeply carved pottery. This bowl has her stylized avanyu as the design. 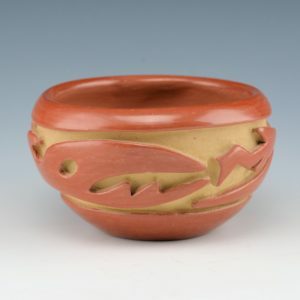 The bowl is fully polished red and has the classic cream colored clay in the background. The avanyu encircles the bowl and the body has cloud and rain designs. It is signed on the bottom in the clay, “Teresita Naranjo” and it is in very good condition with no chips, cracks, restoration or repair. Pasqualita Tafoya was the sister of noted potter SaraFina Tafoya and the matriarch of a family of renowned potters. Her early pottery are primarily carved vessels with some unusual styles of carved patterns. This is a larger bowl of her pottery with a carved avanyu encircling the piece. 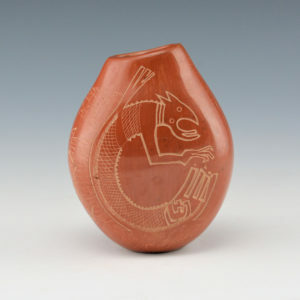 The avanyu (water serpent) is deeply carved into the clay and the surface is fully polished. The bowl is signed on the bottom in the clay, “Pascualita”. Interestingly, there are numerous variations on the spelling of her name depending on the time period when they were made. The bowl is in very good condition with no chips, cracks, restoration or repair. It is nice to see a larger piece of her pottery with such a classic design. 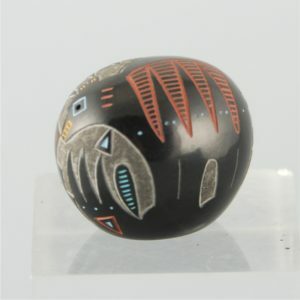 This miniature seedpot by Ray Tafoya is fully polished and round in shape. 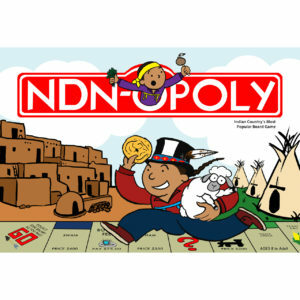 It has a Mimbres style buffalo on the top. It is surrounded by arrowhead and wind designs. All the different colors are derived from natural clay slips. The eye of the buffalo is also the hole for the seedpot! Note how many of the designs surrounding the bear are similar to ones used today by his daughter, Jennifer Moquino. The seedpot is in excellent condition with no chips, cracks, restoration or repair. 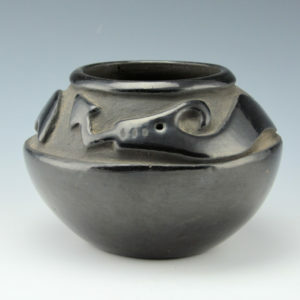 This miniature seedpot by Ray Tafoya is from 1986. It is fully polished and it is an oval shape. 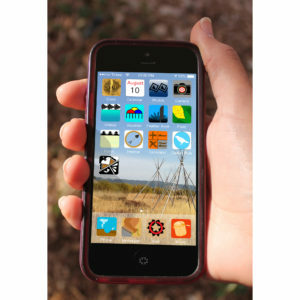 It has a Mimbres style bear on one side. The other side has a stylized bear paw. All the different colors are derived from natural clay slips. Note how many of the designs surrounding the bear are similar to ones used today by his daughter, Jennifer Moquino. The seedpot is in excellent condition with no chips, cracks, restoration or repair.